“StarKid is the blood in my veins.” – Darren CrissIf you’ve never seen GLEE star Darren Criss perform with the rest of his StarKid family then I’m not sure you’ve ever really seen Darren Criss perform. Don’t get me wrong, you’ll find me on the sidelines with my poms poms high in the air cheering for Blaine Anderson, but the joy emanating from Darren when he’s onstage with StarKid is just something different. 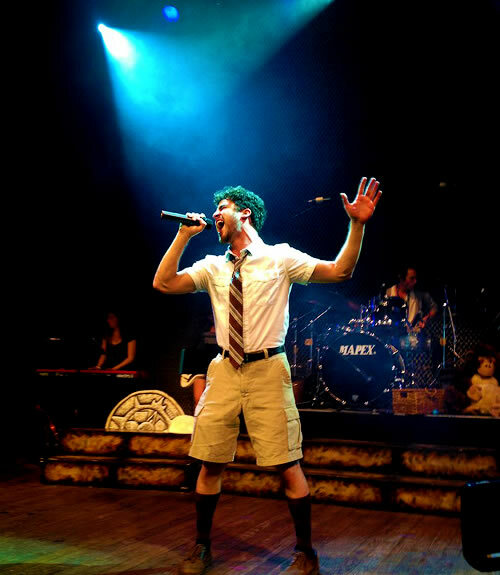 Last night, Darren joined members of the theater company that he co-founded when the Apocalyptour took to the stage at the House of Blues in Los Angeles. His GLEE training came in handy as he was plopped right into the show without the luxury of the weeks of music and choreography rehearsal his friends had, but he seemed to do just fine. Below are some of the musical highlights featuring Darren from last night’s L.A. show. StarKid fans, stayed tuned to GIVE ME MY REMOTE for our special Team StarKid Video Mailbag as SK members share their video responses to some of YOUR questions! If you want to catch StarKid on tour, check out dates and get your tickets here! If you’re going to the Boston show on June 9th, let me know…maybe I’ll see you there. Between Jaime’s voice and the adorableness of Lauren’s face, this video killed me. Thank You for posting these. It’s great to see Darren doing one of my fave songs (Hey Dragon) – lots of fun. I’m super excited to see StarKid sans Darren, but I will miss out one some of these little moments that they may not do without him. have to apply suxh strategies too your won weblog.